United Nations Launches Investigation Into U.S. Drone Program : The Two-Way The inquiry will focus on the civilian effect of the targeted killing program, as well as the legal framework governing drone attacks. President Obama's use of drones, and his direct involvement in who they target, has both U.S. and international communities questioning the administration's secret drone policy. The United Nations' special rapporteur for human rights and counterterrorism launched an investigation Thursday into the United States' targeted killing program. Ben Emmerson, from Britain, will lead the inquiry, which will focus on the civilian effect of the program as well, as the legal framework governing drone attacks. "The inquiry, announced in London, will investigate 25 drone strikes in Pakistan, Yemen, Somalia, Afghanistan and the Palestinian territories. 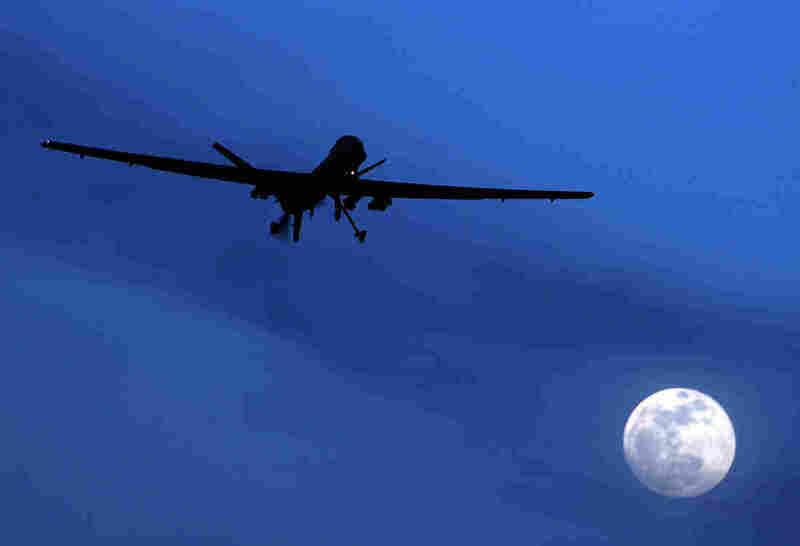 "Most attacks with unmanned aerial vehicles have been by the United States. Britain and Israel have also used them, and dozens more states are believed to possess the technology." The U.K. will cooperate with the investigation but there is no word on whether the United States will follow suit. As we've reported, the Obama administration has vigorously defended the secrecy of the targeted killing program. Earlier this month, a federal judge agreed with the administration that they have no legal duty to "disclose legal opinions justifying the use of drones to kill suspected terrorist operatives abroad." That was a loss for the American Civil Liberties Union, which has challenged both the secrecy and the legality of the program. In a statement, today, the ACLU praised the inquiry. "We welcome this investigation in the hopes that global pressure will bring the U.S. back into line with international law requirements that strictly limit the use of lethal force," Hina Shamsi, director of the American Civil Liberties Union's National Security Project, said in the statement. "Virtually no other country agrees with the U.S.'s claimed authority to secretly declare people enemies of the state and kill them and civilian bystanders far from any recognized battlefield. To date, there has been an abysmal lack of transparency and no accountability for the U.S. government's ever-expanding targeted killing program." Emmerson, the U.N. investigator, told Reuters that this investigation is important because these tactics and technology are "here to stay." The BBC for example cites the Bureau of Investigative Journalism as saying that between 2004 and 2013, "CIA drone attacks in Pakistan killed up to 3,461 people — up to 891 of them civilians." "It is therefore imperative that appropriate legal and operational structures are urgently put in place to regulate its use in a manner that complies with the requirements of international law," Emmerson said. If you remember, this is not the first time the U.N. has delved into the issue of America's targeted killing program. As we reported last year, Christof Heyns, a U.N. investigator on extrajudicial, summary or arbitrary executions, hinted that the U.S. program may skirt international law. "Killings may be lawful in an armed conflict but many targeted killings take place far from areas where it's recognized as being an armed conflict," Heyns said. Attorney General Eric Holder has publicly defended the program. Emmerson will present a report and recommendations to the General Assembly in October.